Crossing Mülheim’s Kaiserplatz and looking in the direction of the tunnel beneath the pedestrian zone. 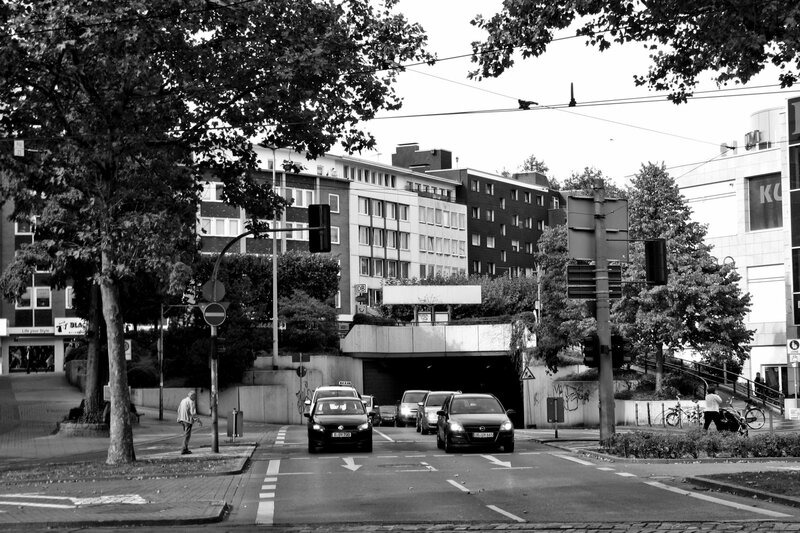 It was built in 1986 during a heavy remodeling of the Schloßstraße, putting the last 100 meters of the Eppinghofer Strasse underground. This is the companion shot to the one I showed in City Views #74 a couple of days ago days ago, which I took from the top of the tunnel. It may be more an underpass than a tunnel, but it is long enough to be flooded when it’s rainly heavily, which happens more often than you can imagine. If you don’t want to cross the street here, you can also take a detour and go up to the Kurt-Schumacher-Platz and enter the shopping mall through the top entrance, like I showed in #23 back in August.